Lake Monticello in Fairfield County is a reservoir along the Broad River built in 1978 for South Carolina Electric and Gas (SCE&G). 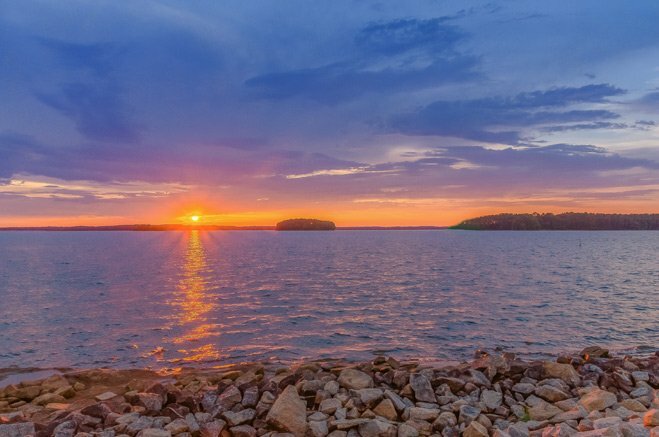 While the South Carolina Department of Natural Resources manages fishing for the lake’s 6,700 acres of surface water, SCE&G owns and maintains the lake and its 54 miles of shoreline. The lake was established as a pumped storage facility for the power company as well as a means to cool the nearby nuclear power facility. The water levels at Lake Monticello are subject to noticeable elevation changes – sometimes as much as five feet – when the nuclear power station pumps water into the reservoir and releases it through turbines to create power. Boaters are to be aware of the possibility of fluctuation when on the water. Though a boat ramp is available and the lake is managed for fishing, jet skis and water skiing are prohibited on the lake. Swimming is permitted, though there is no lifeguard on duty. Catfish, large mouth bass, bluegill, and bream are but a sample of what one might catch after a day on Lake Monticello. Picnic shelters and restrooms are available, though alcohol and pets are prohibited. I would like to see pictures of Monticello, SC. The old Monticello store/post office and some other old building are still standing. What did the town look like? We just bought a log home on this lake. How is the fishing? This is beautiful…..Thank You for sharing it.